It takes only one listen to A Lull's debut single, "Skinny Fingers," to make it clear that the local trio of Nigel Dennis, Mike Brown and Todd Miller have a very good thing going. The band create dreamy, mesmerizing indie pop that's both unconventional and accessible, filled with just enough subtle hooks to draw you in and leave you wanting more. A Lull have recently released their debut EP, are now working on a full-length album and will embark on an out-of-state tour later this month. Before they leave town, though, you can check them out Friday, July 3 at Beat Kitchen and Thursday, July 16 at Bottom Lounge. To start with the basics, how and when did A Lull come together? Nigel and myself were in a band for many, many years when we were younger and when that ended, we were looking to start something new. In 2006, we bought a used Apple iBook G4 and ProTools and we set up shop in my basement. We bought a drum kit and just put all of the rest of our collective instruments in one place and began experimenting with them. We were interested in pulling back, possibly not using guitars, for example, in parts when the two of us would have normally used guitars in the past. Back then, it was a lot of trial and error. We outgrew the processor of the iBook and we became sick and tired of updating ProTools drivers, so we upgraded computers and began using Garage Band to record. We moved from the basement to a practice space, spent more time experimenting, writing songs and discarding them because they weren't quite what we thought we were going for. Mike had been a good friend of ours for many years. Nigel and I both knew that if we were ever going to add another person to the writing that we had then been doing for almost a year, it would be Mike. At the time he was attending school in Boston, so he began recording parts in his apartment and sending them to us to add into songs that we were working on back in Chicago. Eventually Mike moved back to Chicago and we began writing collaboratively in the same room. We continued this for another long period of many months, and then, last December, we decided to begin playing in live settings. Now, after six months of playing live, we've just released Ice Cream Bones and are working on writing new material for our upcoming full-length album, Confetti, and are trying to play as much as possible around Chicago and other cities. Tell us about the inspiration behind the Ice Cream Bones EP and what you set out to get across in the music. What can people unfamiliar with the band expect? The songs on the EP were actually the first ones that we had which were in the most advanced state of doneness. We had initially been writing solely for an eventual full-length release, and at some point along the way, we decided that it would be a good idea to get something out for people to download or hold on a physical CD or whatever. 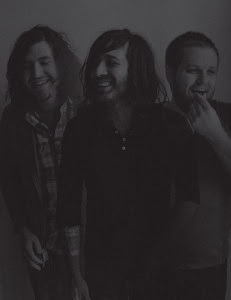 The EP started as a sort of a digital single, with "Skinny Fingers" as what would be the "A-Side" and "Little Echoes" as what would be the "B-Side." Then, when Lujo Records pressed the EP, we were encouraged to put a few more songs on it, to make it more worth a buyer's money. I think that the inspiration behind all of the songs is to tell simple stories of the human condition, themes like love, friendship, betrayal, death, things that everyone deals with. We feel that this is accomplished in songs on the EP such as "Little Echoes," which is about two boys becoming blood brothers or in ""White/Gold," which is about an old friend who has sort of faded in and out of our lives. I think that listeners can expect to hear little things as well as big things. We think that these songs are best listened to through headphones, which is when many of the intricacies are revealed. When writing these songs, we were doing our best to write interesting pop songs. We want anyone to be able to enjoy them, but we also wanted them to be intriguing at the same time. If you could get people to listen to just one of your songs to become familiar with the band, which would it be? "Skinny Fingers,” just because it shows a lot of range, in my opinion. We practiced restraint in the recording of that song, where there is a lot of room for everything to breathe in parts, but then, near the middle of the song, we also show that we can bring some volume and texture by opening things up a bit. Also, I think it's catchy, and hopefully, that person would like it and listen to more. Do you feel living, writing and playing in Chicago has had a noticeable impact on your music? If so, how? Chicago is definitely an amazing city and I think we all feel grateful that our parents picked the suburbs of this city as places to live and grow families. We were driving up to see shows at Fireside Bowl and Metro as soon as we were old enough to drive and before that, we were finding friends who were old enough to drive. For as long as I remember, I've always had opportunities to see phenomenal bands playing all of the time, all around the city and its surrounding area. Those kinds of experiences have to have had powerful impacts on the music that we write, and those kinds of experiences possibly wouldn't have existed if our parents had lived in rural settings where the music scenes were not nearly as vibrant as it was in Chicago for our formative years. Are there any Chicago-based musicians - past or present - that influence your music? Tortoise is definitely a band that we admire and have admired for many years. They're a band that define Chicago, in my opinion. There's something about driving through this city at night, with Tortoise playing through the car speakers. It's like everything just feels right and together. I think I can speak for all of us when I say that we also have a great deal of respect for all of the Blues music that has come out of Chicago - Buddy Guy and many others. I think that Blues are directly related to that idea of making music about the human condition, and that influence can definitely be traced back there. After looking around on your website, it’s clear you guys put a lot of effort into connecting with fans and potential fans in many ways, from a regularly-updated blog to Twitter to a video clip on YouTube. What impact has getting the word out through social media had on the band and why do you think it’s important? I think it's important because all of those things that you mentioned are definitely resources that are there to be used. Why not use them and try to reach as many people as we can? But, more importantly than any of that, I really like all of these things, especially the blog and the Twitter feed, because it gives people the opportunity to observe the band on a daily basis. I think it's interesting to check a band's website and to see that they're recording and to see a couple of pictures of how they're doing it. I just think that the typical format of a website with a bio and contact information or a MySpace page that has a couple of audio samples and live dates leaves a lot to be desired. Of course, we have that stuff too, and if that's the only information that people are looking for, then it's there for them, but if anybody is interested in seeing a little bit more, then there are resources for them too. Now, as for the question of the effectiveness of any of those things, I think that the jury is still out. We're just getting our feet wet and figuring out what works and what doesn't. The video clip was awesome and pretty successful, but that's more attributed to the fact that Nigel did it and he really knocked it out of the park. It's awesome. By now you have quite a few shows under your belt, including sets at Schubas, Empty Bottle, Abbey pub and others. Is there one show that stands out to you so far, and if so, why? Definitely. I can't speak for everyone, but I think that the first show, at Reggie's, was really cool because there was a pretty good turnout for a blizzardy night and it was just really cool to see these songs that we'd only heard in recording playback and on our iPods and computers come to fruition in a live setting and actually work. Empty Bottle was really cool because it was the best sounding show we've played so far. Schuba's was really great because we feel at home there. We love just spending time there and seeing bands there and to have the opportunity to play in this place that we love so much was a thrill. As you get ready to head off on an East Coast tour in mid-July, what are you most hoping for from the experience? Have you played much outside Chicago before? At this point, we've only played a handful of shows outside of Chicago. I really think that we are going into this tour with realistic expectations. Most of us have toured before in different bands and we know that it's rough, but the main priority is building a tour resume, something that a potential booking agency can look at and know that we are serious about actually making this happen. That said, though, this is the most legit tour any of us have ever done. We are playing real venues, not VFWs or garages, and we are playing in cool cities with vibrant music scenes, with some really cool local bands, so we're hoping that it will be the best that it can be. What’s next for A Lull after the summer tour? When can we expect the full-length, Confetti? The writing is coming along nicely, a little bit slowly though with all of the shows that we have been playing, and we are really happy with what we've gotten so far. We're also planning a tour south, to Texas, in August and are planning to do a week or two in each of the coming months though the end of the year. We are playing on Friday, July 3 at Beat Kitchen with Pterodactyl, a band from Brooklyn, NY, and Brilliant Pebbles, a band from Chicago. We're encouraging everyone to skip the fireworks at the Taste of Chicago because who needs that? There millions of people, there's tons of sweat, there are mosquitoes that carry deadly diseases, last year there were gun fights. I just think that it would be a much happier choice to come out to the Beat Kitchen at 10:30 p.m. instead. Like I mentioned before, we are all over the Internet. We have a website and a blog as well as accounts on Twitter, Myspace, Facebook, Vimeo and YouTube. Thank you so, so, so, very, very much!